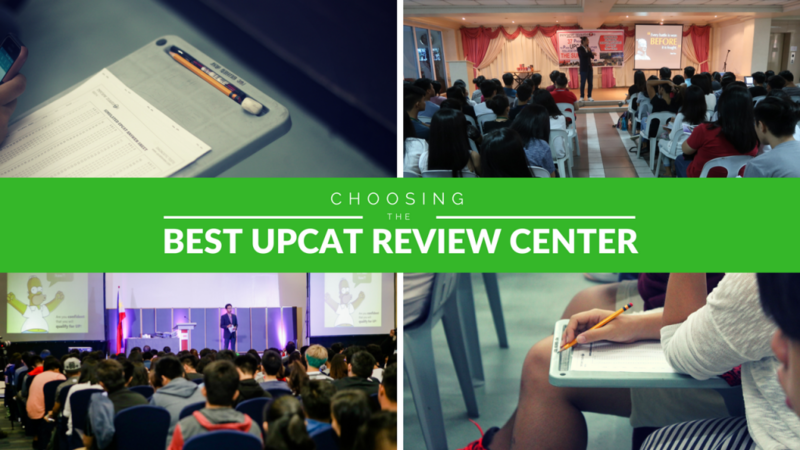 Choosing the best UPCAT review center is a very important part of your journey in passing one of the country’s strictest and most challenging entrance exams. Despite the fact that college review centers do not give you a sure slot in the University of the Philippines’ admission list, it can give you a better chance to succeed by following a review system tailored to help students like you handle the process better. As the number of UP hopefuls grow every year, so is the popularity of review centers offering their own takes in helping students prepare for the UPCAT. This can make it harder for a potential enrollee to choose the best center for their needs, so we came up with a list that can help you narrow down your choices. So how do you choose the best UPCAT review center? We've listed 39 factors that you need to look into to make a sound decision. Is there really the"best" college entrance test review program? But every review center says they are the best. 7. Their program is priced right. We are going to cover each of these key factors in detail below. This will contain lots of information so you may skip to any topic as you wish. The benefit of the traditional, face-to-face type of review is that it is something students are already familiar with. It offers better mentorship between student and teacher, and is a personal approach to learning that can help guide the learners better. It also encourages better interaction among the mentor, student, and their other peers--something which has been proven helpful in learning. One of the perks of enrolling in a review center is the materials and modules you get access to. Note, however, that when it comes to these educational modules, quality should always be top of mind. Use of these kinds of modules will not only help test-takers refresh their memory, but also give them a better grasp of the type of questions and formats they might face during the actual examinations. There’s nothing wrong with borrowing old reviewers from peers who have already taken their entrance exams, but you can’t always be sure of how updated and relevant they are still in the end. The best UPCAT review centers always make sure to keep their modules updated since entrance exam questions constantly evolve, too. Here’s another perk of enrolling in a review center: students get to have diagnostic tests that can gauge which topics they are good at and which ones they need help with. This is done to make sure the test-taker gets the review support they need through effective teaching and tutoring. Contrary to self-studying which sometimes leave students using too much of their time focusing on topics they need to improve on, diagnostic tests give mentors better control over the review process of the student. Review centers follow a proven framework that ensures every student touch bases on all the topics they might encounter during the UPCAT. Again, this is a significant benefit over self-studying since the students are already provided with a program that they need to follow instead of worrying about making one themselves. Lecture discussions open a free environment for students to learn better through controlled guidance from mentors. Having a professional in the field who can readily answer questions about certain topics can make the learning easier and smoother. Review centers offer a 360 approach to reviewing to cover all aspects of an entrance exam. One of this is through simulation tests--mock exams for students that lets them experience what they might face during the exam day. These tests help prepare and train the student’s frame of mind so that they know how to better handle the stress come the big day. Reviewing can be stressful without laughter here and there. Review centers offer a sense of community and belonging that can help lighten the mood better for those who are faced with something as big as taking an entrance exam. Did you know that stress and anxiety are very common emotions to feel during the exam season? The best UPCAT review centers have interactive environments that can help students deal with these better. We’re living in times when the interwebs is a very important part of our everyday lives. The best UPCAT review centers understand that the generation of today is a very digitally-inclined group, and offers online review options that can help students flourish in a setting that feels natural to them. Because the learning setting is not limited to the classroom-type of lecture where a strict schedule is set and followed, online review portals give students better access to their materials any time of the day, wherever they want to review. This is a big advantage for those who prefer to learn in their own time, so enrollees can freely tweak their schedule depending on when they are most productive. The youth of today have grown up with the web. Thus, it doesn’t come as surprising that many of them learn better when presented with digital materials like practice tests, modules, and videos. Online review materials are specifically designed to cater to those who find themselves more productive in tinkering with digital options, so they don’t find the process of reviewing boring and dull. Are you the type of student who randomly gets the inspiration to review, whenever, wherever? Since online review portals can be accessed through the web or even via mobile apps, you can do your studying anytime of the day without having to lug around bulky, printed review modules. One online review portal you can try is the one offered by Review Masters. You can even access if for free by signing up here. The internet is a very efficient platform for discussions, whether it be through live chat or forums. Online review portals can offer interactive support that can connect students with their colleagues and mentors. Review Masters, for example, offers an online community of students and teachers through their Facebook group. While there is nothing wrong with self-studying, being surrounded by individuals who are also preparing for their entrance exams can ease students from a lot of stress. Having peer-to-peer support offers a sense of belongingness which can be very helpful when dealing with something as serious as an admissions test. Moreover, reviewing is always more fun if you have your friends doing it with you! The best UPCAT review centers use flexible learning approaches to their students. Live online classes can prove to be helpful for those who prefer using the internet when learning, but also want a more personal touch to the process. Look for review centers that also offer refresher courses on auxiliary topics like speed math, essay writing, memory recall, and abstract reasoning. Contrary to what many believe, the main advantage of review centers is not limited to the refresher courses they offer. The best review institutions give equal importance to helping students develop test-taking skills which help them mentally and emotionally prepare for their entrance exams. The last few days before the admission test is a very important period for UPCAT hopefuls. The best UPCAT review center follows proven review schedules that will help students keep their minds ready without necessarily pressuring them. The mental state shouldn’t be the only aspect students should prepare for the UPCAT. Top review centers also puts importance on preparing their students physically for the big event. The 37 Proven Tips Workshop, which focuses on giving enrollees a 360 test-taking preparation and training, includes a one-week daily routine and an UPCAT recommended diet plan to help their students prep for their admissions exam. Taking an entrance exam is a complete experience. In order for a student to be sufficiently prepared, they must also cater to their psychological and emotional states. Anxiety--which is commonly experienced by test-takers--can greatly affect one’s performance so it is advisable for reviewees to also get guidance for these aspects. The 37 Proven Tips Workshop of Review Masters covers both on one of their three comprehensive modules specifically designed for UPCAT hopefuls. The entrance exam is divided into four subtests (Mathematics, Science, Language Proficiency, and Reading Comprehension) with a given time limit. Review centers help train students how to better manage their time during the actual exam to make sure they answer all the questions efficiently. All UPCAT takers need all the help they can possibly get to make sure they have everything covered during the entrance exam. While there is no sure way to do this, learning techniques and tips that can make them more familiarized with different question formats can make a world of difference. The 37 Proven Tips Workshop of Review Masters delves deeper on this subject by arming students with techniques like mastering the process of elimination, how to do inductive and deductive reasoning, and understanding context clues. Let’s face it – even the smartest of us can suffer from mental block sometimes. In the event that a student comes across a question and draws a blank, they should know how to make an intelligent guess at the very least. Review centers should tackle topics like how to make a systematic guess, how to spot wrong answers, and how to understand the psychology of the UPCAT creators themselves. Of course, a student’s overall knowledge and preparedness for the questions is most important during the UPCAT. The best review centers not only help increase your IQ but also trains you to have better memory recall, something that is very important if you are about to face a comprehensive exam divided into various subcategories. A lot of review centers have been cropping up recently due to more and more people realizing their importance in UPCAT success. This may leave a lot of people at a loss on how to choose the best among the flock, which leads us to the following aspects. How long has the review center been around? Those that are already established in the industry boast of a better understanding of the dynamics and psychology of the UPCAT because they have been around to understand its trends and changes over the years. Enrolling in a review center does not assure that a student will pass the UPCAT, but the credibility and effectiveness of one can be gauged based from the passing percentage of its students. If you want to look at how credible a review center is, look at its students. Are they happy? Are they satisfied with the program? Do they think it is effective? Before settling on one establishment, reach out to your network of peers (can be older students who have already passed the UPCAT) and ask around about the best review centers in your locale. Pro-tip when considering reviews: also consider statements from parents for a better perspective on the review center’s quality. Read as many testimonials as you can from previous students of the center. Remember not to focus only on the reviewing aspect when doing this, though. You should also research feedback on other factors such as the overall environment of the review center (is it fun to study there? ), its community, and review formats. Some review centers invite tutors who are still students in college and universities. While there is nothing wrong with this, the best review center should have a roster of mentors with proven credentials under their names. Similar to the first item, all the mentors should be considered professionals in their respective fields/subjects. Diversity is also important in making sure that all students are provided with a dynamic learning environment. And when we say comprehensive, it means a detailed explanation of the application process, timelines, schedules, and requirements. How much of your high school grade will be combined with your UPCAT score? Do certain schools get additional credits for their students? Explaining the process can help students gain more confidence during this high-pressure stage of their academic run. This may sound mundane, but entrance exam requirements are strict when it comes to papers and documents. Whether you are taking the UPCAT or an entrance exam at another university, a crash course on proper form requirements is still a must. This should include an explanation of the subcategories, question formats, language used during the exam (will it be a mixture of Tagalog or English? ), and time allotment. By knowing these, students can better prepare and create strategies on how to better handle their tests. This may encompass tips on how to choose the best campus to take your exam, what snacks to bring, and even the best brand of writing materials a student should arm themselves with. Remember, no detail, concern, or worry is too big or small if you are about to take the UPCAT. Of course, the cost is something that should be considered when choosing a review center. However, always remember that when it comes to these establishments, you should always consider the quality before worrying over the amount you’ll be paying. Considering the items mentioned above, do you think it will be worth it to put your money on a review center that meets all these requirements or settle on something that doesn’t really give you value for your money? A review center will not give you a sure spot in the college you are eyeing, but it can give you a good head start. Consider it an investment. There are lots of cheap review programs and fly-by-night review centers out there. We hope that you don't fall for the trap of "because it's cheap" reasoning. We are talking about your future and being cheap about your future will have its consequences. Consider also that you could be paying too high to achieve the same result, which is, to pass your entrance test. There are review centers that charge too high for the same quality review. Enrolling in the best UPCAT review center is an important stepping stone in your university career. By considering the above factors, you can better choose the establishment where you can get the necessary preparation for one of the biggest examinations in your life. I would like to enroll my son in your reviewer center, but the schedule is not good for him. I’m asking if you have a schedule review during Sat and Sun that will start this July . We are from Bulacan. He is a grade 12 student attendibg school from Mon-Fri.